6 Best Garden Tools For Raised Garden Bed. In this article I want to give my readers an idea on which garden tools to use with raised garden beds. In others blogs I have mentioned the need to purchase gardening tools with long handles to help you prevent, or alleviate, back issues. However, with raised garden beds, and especially those that have been raised by at least two feet or more, long handled tools are no longer a requirement. It is far better to purchase the short handled varieties for this style of gardening. So I have listed some good quality, necessary tools to make your life easier. What are the”6 Best Garden Tools for a Raised Garden Bed”? Once again, instead of choosing one particular tool to review for you I have decided to pick out Five Basic gardening implements that you will need to have available in your shed to help you maintain a raised garden bed. I have completed the groundwork for you and selected those I believe that will be of good quality, easy to use and last you many years. What is the best Short Handled Hoe? Off course the ideal gardening tool for any raised garden bed is the short handled hoe. You can imagine how difficult it would be to use a tool that had a handle length of five feet. The handle would be continually getting in the way and getting caught on other plants behind it. Particularly when you are trying to weed or cultivate the soil in your garden bed. With a short handled version you will be able to comfortably reach into the bed and complete whatever task you wish, with a greater deal of comfort. One of the major issue issues I have found with these types of tools is that they tend to be too weak to do the tasks required. Many either break at the welds, are simply to flimsy, or have uncomfortable handles. I eventually found one that stood out from all the others. 1). TRUPER 30663 Floral Garden Hoe with Ash Handle. 15″. This tool turned out to be amazing. 1). Strong, comfortable handle. Well at least it was for my big hands. 2). The Blade was well-made and of excellent quality. 3). Exactly the right size for using in a raised garden bed. 4). Can be utilized for many other jobs apart from gardening such as, scrapping coals out from the BBQ. 1). Some people mentioned that the weld on the blade has been known to be an issue. I’ve never had any problems with mine. Unfortunately though you may find a bad one in the bunch. 2). You could not use it in normal garden beds. I couldn’t anyway, those that don’t mind sitting on the ground might be able to. Rating: 9/10. This rating is given because I love this little tool and have never had an issue with it. What Is The Best Weeder/Cultivator. In this section I will review two very different styles of cultivators and let you know which one I personally prefer A weeder/ cultivator is an important tool that you will need when maintaining raised garden beds. They come in a vast array of types and sizes, and which one you should choose is as much a case of personal preference as the level of comfort you have in using it. Different people will find varying degrees of comfort or discomfort with any garden tool. So much depends on your own size, injuries you might have and your ability to use the tool. You might find that one tool you have purchased simply causes you too much discomfort. If this is the case don’t persist in using it simply because it will save you some money. The damage you could cause your wrists, arms or fingers by continuing to use such a tool is simply not worth living with. It would be far better to purchase a different style, something that won’t do further damage to your body. The following two tools will actually complete the same tasks, but one might be more suited to you than the other. 1). Well built very efficient tool. 2). Will easily handle all soil types from loam to gravel. 3). Great for mixing fertilizer into the soil. 4). Tines made from solid metal. 1). Some People might find the handle a bit short. 2). Apparently some people found that the handle became unglued after a few years of use. This is another garden tool that is a must have for all gardeners, especially if you prefer to grow you flowers or vegetables in raised beds. The DeWit 3 Tine Cultivator will make all your weeding jobs easy and enjoyable. The prongs are fantastic for cultivating the soil. 2). CobraHead Original Weeder & Cultivator Garden HandTool. Forged Steel. 1). Works well on both large and small weeds. 2). The Sharp head and curved neck will penetrate even the hardest of soil types. 3). This tool ergonomic, thereby placing less stress on your wrists. 4). If looked after well it should last for many, many years. 1). Metal is prone to rusting when paint wears off. 2). The plastic handle looks rather crude. 3). The price seems somewhat high for the quality of the tool. It was difficult to give this tool a higher rating because. a). I’ve never owned one. b). Some people that discussed this particular cultivator had a few issues with it. Having said that, overall reviews gave it a reasonably high score. What Is The Best Garden Hand Trowel? Every garden big or little, raised or not will need the use of a hand trowel. Often in gardening you will be planting out small containers or seedling of annuals. You won’t need to dig a big hole for most of these plants, so you will want to own a gardening tool that can help you dig small holes as well as dig out any spent plants. The best tool for this type of work is a short handled garden trowel. It looks a bit like a tiny shovel and is just as handy. I’m very fortunate to own one of these implements and it has had a lot of use over the years. 1). Dewit Forged Hand Trowel. 1). This is a very well-made durable tool. 2). It will last a lifetime. 3). Great for both digging out weeds and transplanting seedling and small plants. 4). The pre sharpened edge of the trowel slides easily into most soil types. 1). There has been cases of people having issues with the neck between the blade and the handle bending. However, it is important to note that no gardening tool is made to dig into concrete. 2). The handle can be slightly large for small hands. Well this is another gardening tool that I own. It has been a fantastic tool for me and has never given me any grief. I scored it lower because I do know of some other people that have had issues. What Is The Best Garden Fork for a Raised Garden Bed? I have to admit that I don’t own one of these small forks, but I have checked one out suggested by others, and boy is it cute. I can see that it would come in handy to cultivate small areas for seed planting. You would also be able to dig out weeds with it as well as mixing fertilizer and mulch through the soil. Personally I don’t think I need one but I simply had to add it here as I thought you might find a use for it. 1). This is a well-made quality tool. 2). Tapered tines easily penetrate hard soils. 3). From what others have said the handle is extremely comfortable for most hand sizes. 4). Ideal for mixing fertilizers, compost, transplanting and weeding. 1). A bit high priced. 2). Apparently the steel between the handle and neck of the tool can bend with time and hard use. Once again I rated this tool lower because I have never owned one. I based my rating on what others think of the tool. I have to admit that I rather like the loo of this tool and I’m sure my wife would love one. Maybe I would to. What Is The best Short Handled Rake? It would be very difficult to use a long handled rake when trying to clean leaves and other debris off a raised garden bed. A short handled rake will do the job far more efficiently. You will be able to reach in under plants to remove leaves and to smooth the soil or mulch. One of the best, if not the best, implements I’ve used to complete this job from the Black and Decker brand. 1). Esschert Design Hand Leaf Rake. 1). Excellent price for this versatile little tool. 2). Great little tool for working between and under plants in a raised garden bed. 3). Comfortable to hold, even for smaller hands. 4). Very Easy to use. 1). The fanned out tines may bend with use but are easily bent back into shape. This is an excellent short handled rake that is very reasonably priced. Whether you need it is totally up to you. However, it would be a great tool to have in your collection. I’m sure you will get a lot of use from it. Which of These Tools Did You Like? Having shown you some short handled tools available for you to use in your raised garden bed. It’s now up to you to decide which of these you think may benefit from purchasing. All are fantastic tools to own, but you may not need them all. It is definitely better to buy short handled versions of most gardening implements if you are determined to create gardens in raised beds. 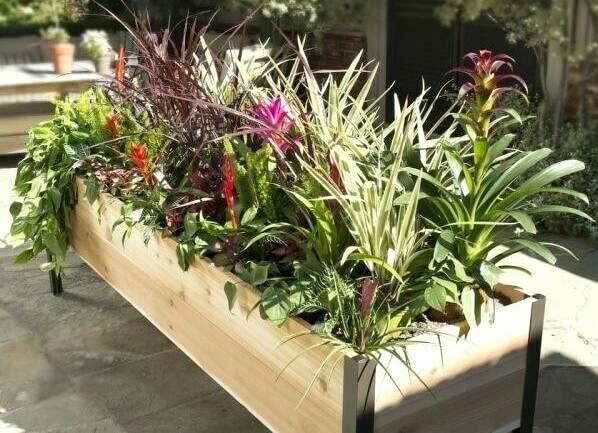 What do you think of the 6 Best Garden Tools For a Raised Garden Bed? If you would like to comment on this article, or would like to do your own review on a short handled tool, please leave your comments in the box provided below. The wife and I just build our beds for next season. We agreed that the hoe with the short handle was our pick.Thanks for the information it was very helpful. I have always wanted a hand fork for my little patio garden. Certainly this one is cute and looks durable too. DeWit is a good brand, so I think I’ll get this one. Thank you for the great post! We just bought our 1st home and im excited to do some gardening! I am a big fan of growing my own food, but recently, I realized I have a ton of space at the side of my garden, that has a path running down the side of it. I know I get boxes and sow those boxes full of food as well. So, at the moment I am growing stuff that grows well all year round. Thank you for this article as there are a few things that I simply did not know the names of and one or two items I now realize I do need to complete my small garden project. I will take your recommendation for these tools in being the best garden tools for a raised garden bed and hope to come back and let you know the results.